No, I don't care for the Riders or Oilers fan in Calgary or Saskatoon. If they're on TV, change the channel! If they're on Radio, listen to another station. And you're ignorance towards the CFL, don't like it don't watch it. I can sympathize with him because it's not just TV or radio, he was describing everything Roughriders that's shoved in his face in his day to day life. Taking the bus home? Bus driver wearing a jersey. Then the people you cram in with are wearing green and are talking nothing but last weekend's Rider game. Waiting in line at the doctor's? forced listen to rider ads on the radio, while other patients are watching a reply of the game on their phones. Doctor eventually meets with you and while he's checking your blood pressure, his small talk goes "how about them riders?" Last edited by Barbecue; 08-15-2014 at 03:50 PM. I don't watch the CFL. Correction - the only game I watch is the Grey Cup, because at least it means something. Johnny Gaudreau will win the Hart Trophy in 2018. It's so sad how serious Saskatchewan takes the CFL. Bush league and bush province deserve each other. The CFL is not "bush league". It is the football equivalent of AAA baseball and the American Hockey League, and is on par with college football in the US. Saskatchewan, however, is no good. I generally think that people who diss the CFL are unCanadian. There is nothing more Canadian than the CFL, including hockey. SK #1 AB #2. From a former Calgarian who moved to small town SK. Discussion over! Everyone who agrees with you should do the same. Then the discussion can end. Sask is Alberta's landfill, ship the garbage back there! You're in the very tiny minority, there is an exception to every rule I suppose. And there's nothing more Canadian than essentialist nationalism, right? Anyways, back to the topic at hand. I'm in Madrid, at a hostel, and I've met this girl from Saskatoon, who proudly declares she packed her Riders flag with her. I know you guys will never believe this, but she's really dumb and annoying. Last edited by DOOM; 08-22-2014 at 01:12 PM. Nothing wrong with being a fan of CFL or WHL if you realize its place. Have WHL season tickets due to living in a small town that doesn't have a NHL team. If you keep it in perspective and see it for what it is (minor or junior league) thats one thing. It's when CFL fans (read: Riders fans) treat the Grey Cup as somehow being as important as the Stanley Cup, or spend hundreds of bucks on merchandise, or pack flags with them to other countries that it becomes pathetic. When you realize its a poorly run 8-team minor league of castoffs who all work 2nd jobs during the week and treat it accordingly in terms of importance then that's fine. You won't see me around Kelowna wearing Rockets jerseys, wearing various Okanagan fruits on my head and following the team to Calgary in order to heckle Hitmen fans, get wasted, attack police officers and get kicked out of the Dome. Saskatchewan is no good, and neither are their "sports" fans. The CFL is essentially Divison I-AA compared to Division 1-A in college or League One in England versus the EPL. It's not the same level of quality, but the fan support can be as rabid. Saskatchewan fans though are just annoying pricks who act like four championships in 105 years actually means something. And it does, that even a blind squirrel finds a nut every now and then. But they are the least successful franchise in the CFL in terms of winning titles (besides the freaking expansion team), yet their fans have the sense of entitlement and belief they are great, just like New York Yankee fans. It's preposterous, know your place Rider fans. And stop starting some many fights and getting so drunk at games. 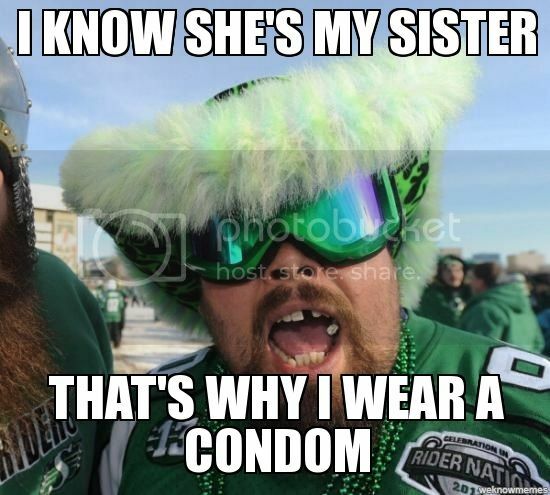 Those seem to be two of the biggest draws to being a Rider fan. Last edited by Senator Clay Davis; 08-22-2014 at 01:52 PM. Thank you for providing the rules on how big of a fan of the CFL I can be. I can live my life better now. Very few things grind my gears more than someone at a Flames game in February wearing a Riders jersey!